Located in the south west district of Clapham, London, we are today visiting a sophisticated and stylish terrace home renovation. These days Clapham is a highly sought after suburb with a range of differing residential styles. The 220 acre Clapham Common, from which today's house sits adjacent, features many fine late 18th and 19th century houses. The architecture varies from large Queen Anne, Regency, and Georgian era home within the Old Town, to grids of Victorian housing in the Abbeville area. Furthermore, to add to the diversity of the district, there are also a few council run social housing estates from the '30s to the '60s. The area that was once considered an ordinary middle income location, is now an affluent area, with good proximity to transport into the London business centre. This project takes us to Englewood Road, situated just off of the Common, and parallel to Circular road. 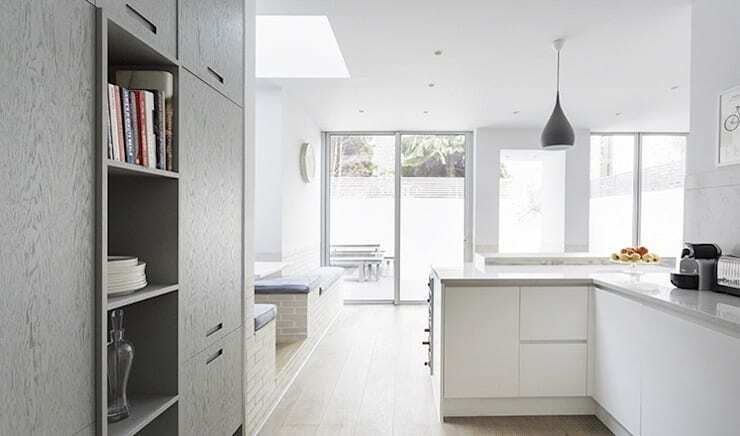 The three-storey Edwardian house in question has been entirely refurbished and renovated by Stagg Architects, with additional construction of a single-storey rear extension and loft conversion. With a budget of £250,000 (approx $540,000 SGD), the architects sped up the process of tender drawings and specifications, while the project was still being considered by the planning authority. Therefore, as soon as permission was granted, construction commenced. Thin-format platinum white brick with white mortar were used, and thin-frame glazing was also developed. Due to these materials, a high level of attention-to-detail was applied throughout the project. If you would like to take a tour of this light, bright, and wonderfully updated home, check out the images below, and perhaps gain a little inspiration for your abode! To begin our tour of this intriguing and light-filled home, we are going to have a look at one of the most fabulous spaces within this house. 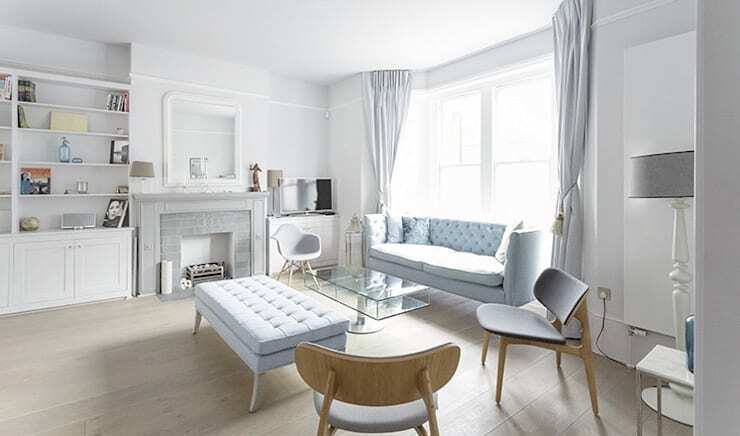 Replete with a host of intriguing furniture from various eras, the living room is wonderfully light, bright, and chic! The pastel tufted sofa is a highlight and feature of the room, while the matching ottoman lounges brings the setting together. Mid-century modern chairs are dotted around the room, and inject a sense of design nous and nonchalant cool. Centre to the room, the fireplace stands out as a prominent feature, while still blending in with the overall classically modern design. 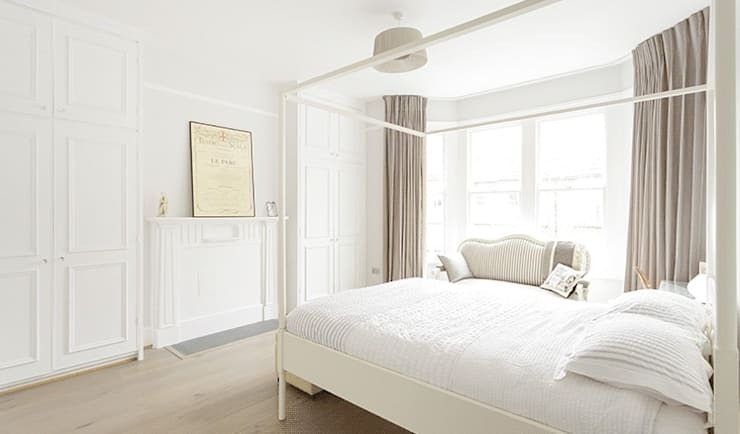 On the other side of the room, the large bay windows filter in an abundance of light and are tastefully dressed in soft pastel coloured drapes. This extension provides much needed living and open plan family space for the dwelling, while bringing the entire structure into the 21st century. As you will see throughout this tour, the predominant colour scheme that has been employed is a range of different white tones. This has been followed through the entire house, and evokes a clean, crisp, and modern aesthetic. In this image we are taking a look at the back of the kitchen space, peering through to the courtyard. To the left of the image we see the abundant storage that has been custom built and designed to suit the interior space. Perfect for housing tableware and other living accoutrements, this is an essential inclusion for contemporary living. As we head back to the new extension we see the courtyard area. This is a neat space, which provides a tidy entertaining spot for any event or soirée. 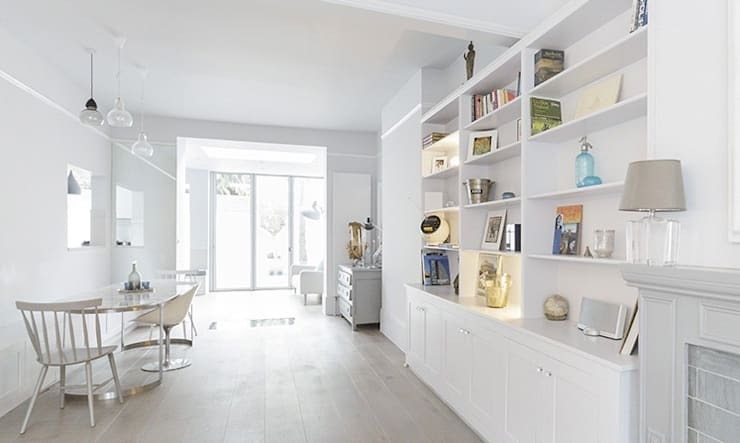 Again the colour scheme is white, with light timber flooring adding a light yet determinable contrast. 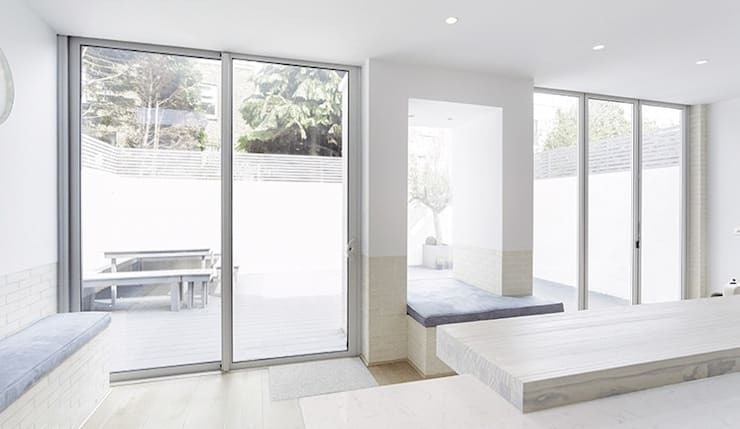 The outdoor space is reached via the sliding floor to ceiling glass doors. These doors allow the outside breeze to be brought inside, and again adds to the functionality of the entire newly constructed space. In the left hand side of the image, we are able to see the new kitchen counter. Let's take a closer look! Throughout the home, there is a countless array of bespoke features. These wonderful custom designed additions add to the overall appeal of the home, and separate it from the rest. In this image, we see the new kitchen and integrated dining space. The dining area has employed the brick construction to add a booth-style eating spot, which is both informal, and cute at the same time. With wonderfully coordinated upholstered cushions, the room looks seamless. The kitchen is again sleek, and in a white tone, with downlights added for extra illumination. The worktop features two separate pieces of timber that sit above one another, providing a breakfast bar dining space. 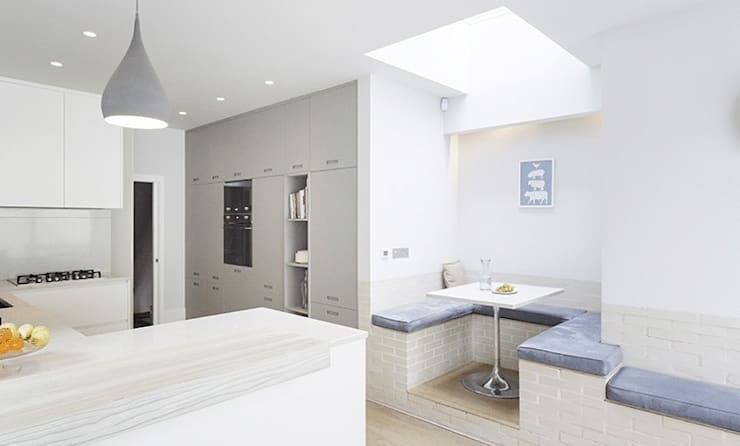 Finally, a roof light is situated abode the dining area, adding natural illumination, and ensuring the corner doesn't become dark or dull. Who doesn't love a sumptuous master bedroom, replete with four poster bed, and lavish textiles? This room has it all, the while colour scheme adds luxury, while the fireplace has been filled in. The filled in fireplace still looks wonderful, and is a great shelf for artwork and curios. Heavy drapes are employed to keep the light out at night, and the furniture is delicate and feminine. 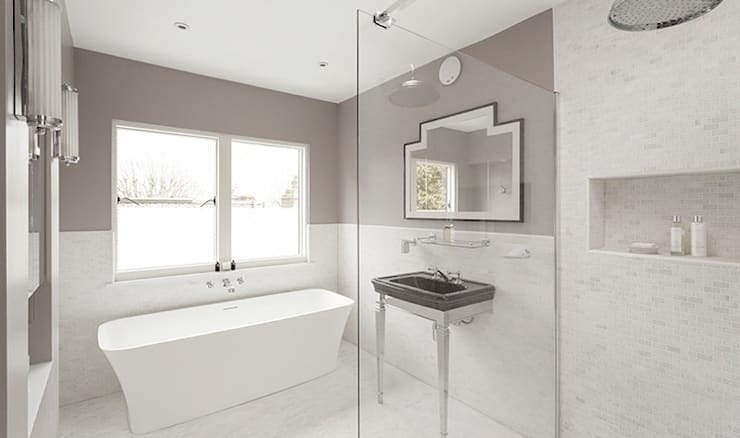 Like all fancy master suites need, there is a gorgeously sleek ensuite bathroom next door. Joined to the main bedroom, this space provides a freestanding tub, heritage basin, and art deco features throughout. It is a wonderful blend of contemporary and traditional, combining the two to form a truly luxurious and timeless washroom. As we saw earlier, this house has been wonderfully updated and configured for modern living. And the thing about 21st century living… we tend to accumulate a lot of household accessories. Be it books, linen, toys, or old school work, there is always something that needs a place within your home. Short of spring cleaning your entire dwelling, the next option is to install a good amount of storage. Natural light is generally the key to comfortable living spaces. Without it, areas are dank, dull, and exceptionally dreary. To combat the lack of light within a space, you essentially have two options, remove walls and open up the area, or install extra glazing. 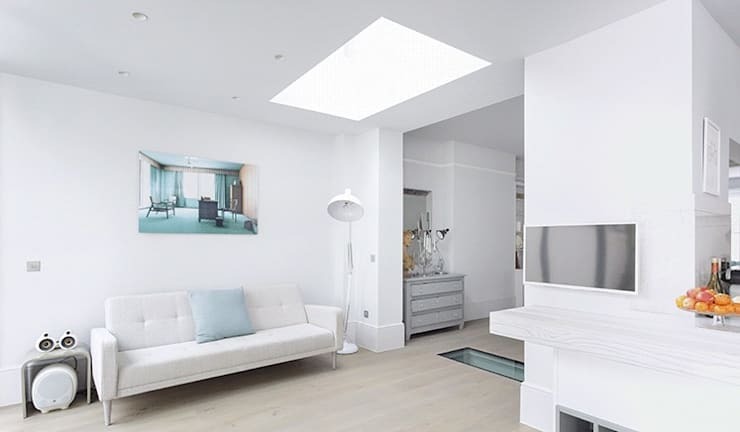 However, if your space isn't within an area that has the possibility of extra windows, you may want to consider a roof light. Here in this image we see just one of the several roof lights that have been installed in this home. They provide wonderful illumination, and reflect the white colour scheme effortlessly!